Texans love to be outdoors! Your yard should be your sanctuary. Don’t let dogs, trees or just dirt patches get in your way of really loving your lawn. 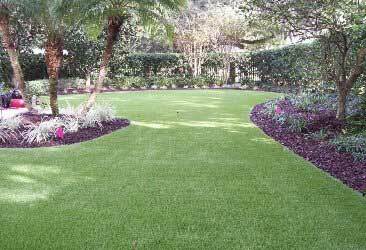 Get Ideal Turf to make your lawn beautiful so you can use it year around and it’s always green. Our renowned artificial grass company in Dallas offers the best engineered artificial turf Fort Worth. Much care has gone into selecting the finest infill, artificial turf Dallas and sub base. The three must work together to offer the best drainage as well as the best turf foundation. Whether it is for your entire home or just a problem area we have the right turf for you. Dogs go crazy over Ideal Turf specialty “dog friendly turf” They no longer get hollered at for having muddy feet. The secret is 100% permeable backing that allows water and urine to penetrate the turf totally. Every golfer wants to improve his game what is so fun about golf. One way to improve your short game is to have your very own putting green and your wife will know where you are. You can even add chipping pads around your yard to work on your chipping. What could be more fun. Invite your buddies! With artificial grass it is much easier to keep your pool clean. No more grass blowing in your pool or no more dirty feet getting into the pool. Nothing makes your pool more beautiful than complimented by year around green artificial turf. Spend just a little more and make your backyard complete. 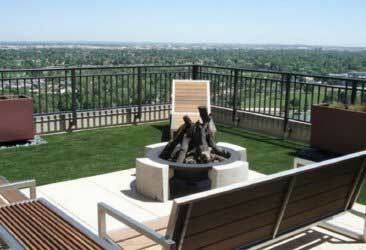 Compliment your view with artificial grass on your roof or deck. 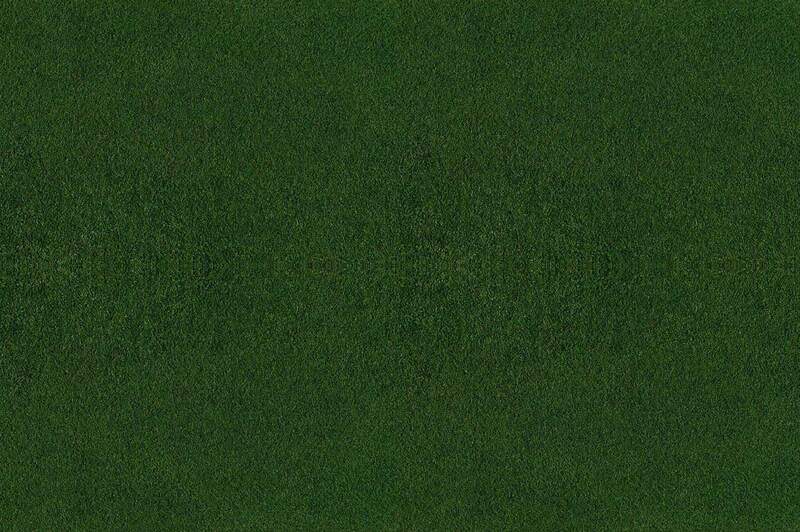 You cannot beat the plush green turf under your feet. Green is such a pleasing addition to any roof or deck. We can soften any hard surface such as concrete with artificial grass. We often think that artificial turf is used only outside and on the ground but no! The uses are endless. 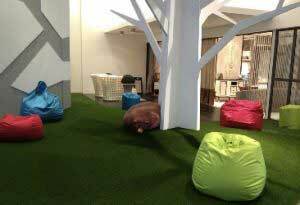 Artificial grass is a welcomed addition to dens, playrooms, yes even put it on walls. Be creative! 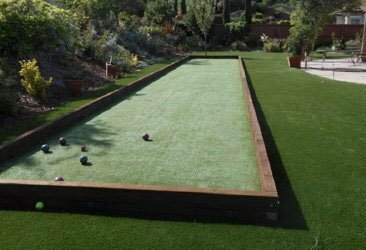 Bocce ball is another opportunity to play outside and fun for all ages. Just pick an area on your lawn and allow Ideal Turf to create a new fun activity for your kids, grandkids and friends. In the 3rd generation of turf development and more natural looking than ever before. 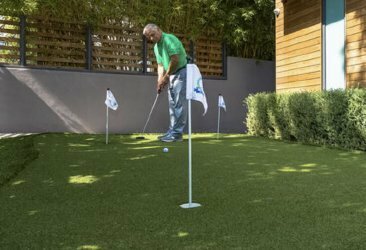 Due to advancements in manufacturing synthetic grass, artificial lawns are now an attractive solution for homeowners. Our turf installations are performed by professional installers, backed by our installation warranty, and made in the USA. Should last 20-25 years. Unmatched, transferrable 15-year warranty. Exceeds standard set forth by the Synthetic Turf Council. Has a permeable backing and drains in excess of 300 inches per hour! No more water wasted on quenching insatiable lawns, no harmful toxins to kill weeds, no gas-powered lawn-trimmers. We use the most rounded sand found in the United States. Allows better drainage. We use only the finest base located in Texas. Unlike decomposed granite & crushed concrete, our base both compacts and drains. Just the right size to create a solid surface under the turf and the correct amount of fines to properly compact yet allow adequate drainage.